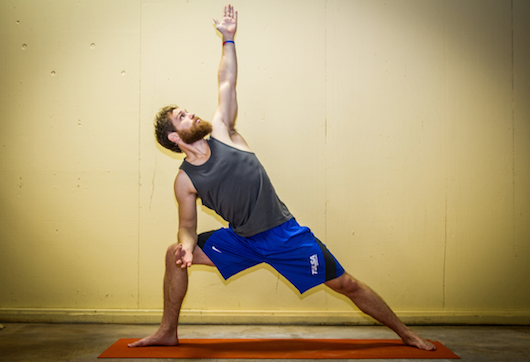 Side Angle Pose is a great pose for building strength and the perfect next step after Warrior 2. Use this pose to add variety to your yoga practice with lots of levels for variation. 1. Begin in Mountain Pose. Turn to the side of your mat, extend your arms sideways to shoulder height, palms facing down. Step your feet as wide apart as your wrists. 2. Turn the forward foot outward 90 degrees so your toes point to the top of your mat. Bend your forward knee to a right angle. Make sure to align the knee over the heel. Turn your back foot slightly.. Keep your back leg straight. Mentally press down into the forward foot and the back foot evenly. Open the hips so they are parallel to the forward leg. 3. Lower your forward arms so it rests lightly on the forward thigh. Try not to put too much pressure into the leg. Keep arms and core engaged. 4. Reach the back arm up towards the ceiling. 5. For more of a challenge, move into Extended Side Angle, take the arm up and over the ear. 6. Breathe deeply as you hold the pose for 5 -10 breath cycles. 7. Coming out of the pose, straighten the forward leg and begin to turn to the back of your mat and repeat on opposite side. Modification: Use Yoga block instead of resting arm on the leg. Contraindications: Check with medical doctor if you have neck or shoulder injury before trying this pose.